Recently we have all been asked to celebrate the youthful commitment to ‘save the planet’ personified by the ‘Youth Strike 4 Climate .’ Hundreds of thousands of children, across the world, have been involved in various forms of strike action in protest against humankind’s heating of the planet through our CO2 emissions. Many were given leave from their lessons to ‘demonstrate.’ This has been widely welcomed by the political class. Jeremy Corbyn, Caroline Lucas and Nicola Sturgeon were but a few of the leading politicians supporting this ‘coordinated day of action. Particularly delighted was the President of the EU Commission Jean Claude Juncker. He tweeted his support and a committed a quarter of the EU’s annual budget for programs to ‘mitigate’ against man made climate change. That’s an annual expenditure of more than €36bn, based upon the EU’s 2015 figures. As ever with the EU, it is difficult to know precisely how much of your tax money they spend or where they spend it. They haven’t independently audited their budget accounts for more than 20 years, preferring their own ‘in house’ auditors. Wouldn’t we all? While mass absenteeism presented a bit of a problem for schools, who should record a child’s absence for any reason other than illness as ‘unauthorised,’ the National Association of Head Teachers (NAHT) union were also supportive. Despite some ‘official concerns,’ clearly there was tacit acceptance of the strike from government education departments around the world. All of which begs some interesting questions. Whose idea was it that schoolchildren as young as 5 yrs old should get involved in political protest? Who coordinated the ‘day of action?’ What were they protesting for (or against) and, most importantly, who funded it and why? 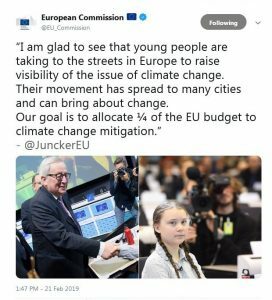 Allegedly the YouthStrike4Climate came about largely due to the efforts of 16yr old Swedish schoolgirl Greta Thunberg. Greta staged her own school day walkout and formed her solo picket line outside the Swedish Parliament in the lead up to Swedish elections. Just two days before the elections, and only two weeks after starting her solitary protest, international media organisations the world over, such as the BBC, were already extolling the virtues of her ‘struggle.’ An incredible piece of global media manipulation by one so young. Greta’s achievements are truly staggering. Not only has she delivered a moving Ted Talk (owned by Chris Anderson’s tax exempt Sapling Foundation, whose publishing company Future plc apparently settled out of court for violation of U.S online child protection laws) but also gave an ‘educational talk’ to the United Nations at the COP24 climate change summit. Her international government connections and use of social media to spread her message around the world is incredible. Especially seeing as she was just 15 when she began her protests. In the 8 months since opening her Twitter account (in June 2018), she has amassed 195,000 followers and her various videos have been shared millions of times. Perhaps her amazing global reach is understandable when we consider that Greta’s rapid emergence upon the World stage didn’t just ‘happen,’ but rather appears to have been carefully coordinated by grown ups. Her initial protest fortuitously coincided with the publication of her mother’s book. Greta’s mum, the opera singer Malena Ernman, worked with PR man Ingmar Rentzhog, who promoted her publication. Rentzhog, coincidentally, launched his climate change social media campaign group “We Don’t Have the Time” the same day that Greta first started her protest. Making a tidy sum along the way…. It is by the goodness of God that in our country we have those three unspeakably precious things: freedom of speech, freedom of conscience, and the prudence never to practice either of them. Dave Emory: Who is Tulsi Gabbard?